It was the best of times and the worst of times for data academia this week, at least in my take on the articles. On the one hand, I found in the Robertson & Travaglia piece a really informative and concise overview of links between our ‘Big Data’ issues today and historical precedent in the 19th Century I hadn’t considered. The ‘Avalanche of Numbers’ fascinates me, and I’m surprised I hadn’t heard it specifically referred to before this point. I also appreciated the straightforward discussion on the perils of ‘deviant’ social categories in objective data, though of course that’s a topic that has haunted us since Week 1. But what I enjoyed less, and therefore what will subsequently take up more of my attention, was “Understanding Social Media Logic.” Though I’m likely being a bit too hard on the article (polemics make better blog posts), I felt that while the four “grounding principles” might encompass a helpful tautology to serve as a starting point for a social media research project, overall they presented as curious choices to frame a discussion of social media ‘logic’ in relation to mass media logic. Most simply put, I thought that both ‘programmability’ and ‘popularity’ both boiled down to human agency in a manner non-unique to social media. I don’t even think this was something obscured or manipulated for an unfair point—the article is straightforward that human agency is half of programming, and in the other half (technology) invokes Gillespie’s contention that in technical social media programming practice, human choices “have not vanished…[they] are processed imperceptibly and automatically” (6). Popularity, too, seems an almost-synonym for what’s already being discussed here, and I think the argument that the difference between social/mass media logic is that social media can measure popularity while also trying to influence it falls flat based on the direction of influence. The example here is that large groups of users can band together to influence popularity, but how is that any different from viewers of television programs or non-digital political activists (besides the higher efficiency of the social media platform)? There is a mention of platform owners using popularity to promote causes, but the given citation seems far more a textbook example of programming that could have existed on any broadcast news report from the last fifty years. The final pillars (‘connectivity’ and ‘datafication’) seemed far more useful to me, but at this point I’m not sure about their framing and it seems the concepts might be mobilized more usefully in a different discussion. Especially considering the opening case study of the ridiculous behavior surrounding a teenager’s birthday party, the unpacking of these concepts as social media fallout could be handled far more specifically in relation to existing mass media logic. How I’ll be dressed on Monday? Hi all, and sorry for the delayed posting! Here are some thoughts on data, epistemology, power, and Baudrillard to spice up your Saturday morning. Reading Hamish Robertson and Joanne Travaglia on the connections between the “data revolution,” which swept 19th-Century Europe as the agencies of a newly centralized and bureaucratized state set out to better understand and control rapidly expanding urban populations, and our own crisis of “big data,” I felt like I had found the response to Baudrillard I had been looking for. What I most appreciate in this piece is the fact that, while certainly critical of the ideological functions of contemporary big data discourses, Robertson and Travaglia resist the urge to simply jettison the phenomenon altogether, excising it from the province – even the possibility – of meaning. Rather, taking a more historiographic approach than Baudriallard (whose main historical reference seems to be his own now-revised opinions on the meaningful/less-ness of mediated images), they give themselves space to sit for a moment with the weird politicalities of big data, thinking carefully about 1) what ‘big data’ actually represents or allows us to access, and 2) the specific institutional formations (the disciplin-ification of the contemporary university, the sponsorship of the state, etc.) that helped it to take shape. Where Baudrillard was emphatic in his belief that representational technologies like opinion polling represent absolutely nothing – that they are properly the objects of simulation, rather than of meaning; objects that narrow the field of agency and resistance to ironic subversion and mocking laughter – Robertson and Travaglia rightly note that, even if big data do not represent what we think they do, they nonetheless represent something, and this something is certainly something worthy of our consideration: “That a census or a social survey is a snapshot of the way our societies are regulated is rarely remarked on and instead emphasis is given to the presumed objectivity of the categories and their data. This is the ideology of the small data era in action – the claim that it is science and not society that we are seeing through such instruments.” In other words, even if the referent of population data is not the population itself, we are still dealing with reference and meaning; we are glimpsing not a population in its totality, but the various ways in which that population is defined, managed, and governed. For those of us concerned with the contentious social and cultural topographies of data – say, those of us in this class – this is something I don’t think we can afford to overlook. Our data collection activities might not, in the end, tell us that much about the objects we want to study, but they do offer an important opportunity to glimpse the ways in which we as researchers imagine our objects, or more precisely, how we imagine them to be accessible and available within the parameters of academic knowledge production; to reflect on how we attempt to locate ourselves within (and potentially without) the conditions of our scholarly formation. These are questions of epistemology, about knowability. Quite appropriate, then, that Robertson and Travaglia seek appeal to Luciano Floridi: “Floridi writing on the philosophy of big data, has said quite specifically that the real big data problem we face today is less one of the quantity or quality of data or even technical skills but rather one of epistemology.” If, as Robertson and Travaglia note, “a great deal of social data is coercive in nature” – or at least ensconced within the particular ways of knowing we inherit from 19th-Century European social science, and thus intimately bound up with the pathologization, governance, and in many cases eradication of certain populations – I think it behooves us to aspire to more than Baudriallard’s mocking laughter when confronted with the massive and admittedly overheated discourse of big data. We need to find where our data sets touch the world, and consider what that touching might tell us about the politics of knowing, even and especially when it “fails” to represent the world. Hamish Robertson’s and Joanne Travaglia’s “Impact of Socil Sciences – Big Data Problems We Face Today Can Be Traced to the Social Ordering Practices of the 19th Century” provided a wonderful reading that situates the many issues and discussions of big data into a historical framework that allows us to understand the data revolution as a development of a first data revolution in the 19th century. This first data revolution is so ingrained in the Western world that it is difficult to even perceive it as anything but natural. This era of information organization was the period of classification, a period that sought to classify a variety of organisms such as animal species, words and social dynamics. I use the word “organisms” to emphasize the historical mobility and liveliness of society’s forces and products. While science provided the tools for classification, the authors argue that classification is nothing but natural. 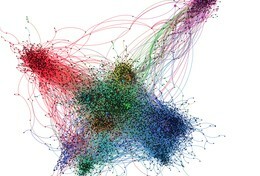 In the contrary, “a great deal of social data is coercive in nature” (5). They attempt to reveal it is not science, but society, that we see through the instruments of classification. This historical background of data management and classification on the 19th century creates an interesting dynamic when integrated into Jose Van Dijck’s and Thomas Poell’s “Understanding Social Media Logic.” In this work, the authors attempt to demonstrate how social new media logic infiltrates and is infiltrated by mass media and offline processes in the same way that 19th century data management and ideologies can be found in mass media and new media logic. In addition, I appreciate “Understanding Social Media Logic” in that it is almost didactic in its organization and presentation and allows the reader to carefully meditate about the different aspects of social new media (logic, programmability, popularity, connectivity and datafication) and how they are integrated in individual lives. The comparison between the two articles is also fortunate in that it reveals how the image of the scientist capable of presenting natural and objective data has been adapted from the 19th century animal and plant sciences to television news broadcast to television product advertising and to the apparent objectivity of non-human mediated logarithmic information. Ironically, while many other articles did alert readers about the subjectivity of data collection and the important place that data collection acquires in the struggle for power, Van Dijck and Poell are able to evince this subjectivity and social coarseness of classification by providing a 19th century-style classification of different media logics and attempt to remain objective in their assessment of media effects. While Robertson’s and Travaglia’s article provides a background that clearly influenced the logic of media, Van Dijck’s and Poell’s offer a present context to read social new media (and mass media). These were indeed very interesting articles, especially when assigned together, that allows for a good reading of the “media world” today. The reading this week had me thinking of a lot of different things coming up in these news these days and some interviews I’ve listened to related to these issues. with the first piece by Robertson and Travaglia I couldn’t help but think of the election process and the enormous number of polls that are taken and what the data, given to us in almost always unreliable ways without much context, are getting mostly wrong. When it comes to the polls about the Republican and Democratic primaries, it seems as though while they are usually fairly reflective of what will happen in a given state’s primary or caucus, they are misleading in the overall understanding of who may or may not be the party’s nominee and how they might do in a general election. I was listening to Nate Silver who started the website 538 (uses data to talk about politics, entertainment, the economy, sports, and pretty much any and everything else) and is well known for his accuracy in predicting nearly all 50 states correctly in the 2008 presidential election, and he mentioned how there is a strange reversal in the state of polls in primaries and generals. One of the main points was about Donald Trump and how his enormous support that makes him the front running candidate in most primaries is far from the case in the general, where you have a much different electorate that doesn’t find his style quite as charming as primary voters. But programmability also made me think of how these platforms “steer” users and how Facebook in particular has been getting a lot of flack for years now about how they use users’ personal data. Ironically, the Apple and FBI case shows another tech company (not directly social media but still) that has had a dubious track record on a number of issues, but here Apple comes out as the champion of privacy and constitutional rights. It seems like in the same mistakes keep happening (like the first article says) in which these companies and the government are so excited about the prospect of datafication of everything, that they end up oversimplifying its use, which is extremely dangerous, and not to sound so intense (and ironically I’ll be oversimplifying a bit here for effect) but isn’t too far off from when oppressive regimes crack down on dissent. This week’s readings offer a nice cap to many of the discussions we’ve has in this class, in particular by addressing the following two issues regarding data epistemologies: history and infrastructure. To use an analogy from Jonathan Sterne, these matters are the water in which the fish (in this case users, producers, coders, etc) swim. I largely agree with the points made in Hamish Robertson and Joanne Travaglia’s piece, and with the throughline they draw between 19th century scientific practices and epistemologies and those “problems” that define the contemporary information age. For that reason, I’m choosing to focus this response on Jose Van Dijck and Thomas Poell’s piece on social media logic which I found both extremely useful and generative in my own work. The piece opens with in essence a discussion of the role that social media and mass media play as invisible intermediaries that are not so invisible. This point is very much simpatico with the scholarship of Lisa Gitelman, Tartleton Gillespie in his work on platforms, as well as other media industry scholarship on digital intermediaries and infomediaries. That is, all of these scholars discuss the ways in which services that propose to merely “connect people” do much more than passively enable people to connect, but rather actively change the way that this connection is defined and activated. Van Dijck and Poell build on this idea by weaving a narrative about the ways in which a newer social media logic intertwines with older logics of mass media, offering a detailed and thoughtful discussion of user/producer relationships, programmability, popularity, connectivity, and datafication. I think individually, all of these sections are successfully argued—particularly through the nuanced discussion of the way users, platforms, advertisers, and online environments shape each other. My confusion arose I think, in the more specific definitions and choice of words to describe these relationships. Social media logic is defined as: “the processes, principles, and practices through which these platforms process information, news, and communication, and more generally, how they channel social traffic” (5). Meanwhile, mass media logics are the “set of principles or common sense rationality cultivated in and by media institutions that penetrates every public domain and dominates its organizing structures” (3). These definitions are certainly not very close, and immediately it felt to me like the argument was set up to compare apples to vegetables, or something along those lines. The authors do end up explaining the differences more carefully later on by talking about the way mass-media logic is one way editorial strategy and social media logic is two-way dialogic relationship between users and code, but I think ultimately their insistence on maintaining the paradigm of “logic” is a detriment to the overall flow of the essay. Logic does connote invisible infrastructures, but it seems less suitable to a discussion of tactics, or the purposeful navigation of these infrastructures (I’m thinking along the lines of Rita Raley here, who uses the word “tactics” to discuss intervention, disruption, and pre-emption on the part of individual actors). And, if we are to accept that the word “logic” encompasses both of those things, then I have to wonder—why is it the authors feel a need to choose a word that is so broad? My second gripe with this mass media “logic” vs. social media “logic” paradigm is that it seems to exclude other genealogical explanations for how we interact with social media beyond mass media. What about, for instance, the influence of Google search on our penchant for using keywords and hashtags? What about those classification systems pointed out in the other piece—the libraries and census organizations that first developed the rubrics for data epistemologies? These certainly aren’t the same “logics” as mass media logics. Anyway, I understand that the argument that this essay missed a lot isn’t that powerful given the word count restraints that all short articles have to deal with, but I do feel that this discussion of logics is narrow in a way that it need not be, particularly given the more nuanced arguments made in the individual sections. In any case, I did really like this article in that it describes very well the things that I am trying to pay attention to in my data visualization project: namely the way in which particular platforms (twitter in my case) cause users to adjust their tactics of communication. My word cloud for Planned Parenthood is below. I’ll be categorizing groups of words into topics in my final project: calls to action, politics, women’s health, and references to actual abortion (chop, body, parts etc). // Returns a function to compute the interquartile range.